Kuwait, April 11, 2017: Audi customers in Kuwait showed off driving skills of a different kind at the weekend, teeing off at the annual Audi quattro Cup tournament. The prestigious and hugely popular event saw 50 teams of golfers battling it out for much more than bragging rights against fellow Audi owners over the demanding fairways and greens of the Sahara Golf Club. 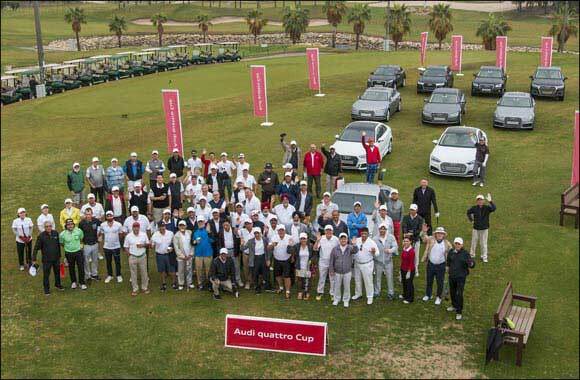 The Audi Kuwait customers drove, chipped, pitched and putted their away around the challenging 18 holes in the hope of putting themselves in pole position to win the Audi quattro Cup Kuwait and a trip of a lifetime for a place in the Audi quattro Cup World Final, from December 1-5, 2017, at Quivira Golf Club in Cabo San Lucas, Mexico. After some scintilating competition in an action-packed day, the battle for top honours was an extremely tight finish. The leading three pairs all scored 44 stableford points, with Mohammad Baba and Khaled Saad AlSabah winning on a countback to take first place and the coveted prize of a place in the world final in Mexico. Talal Al Othman and Hanadi Al Marzouq finished second, with Wael Al Welayti and Fadia Emadi collecting third place. Khaled Saad Al Sabah was in the prizes again on the course, securing Nearest the Pin on Hole 11 and Andy Palmer picked up Nearest the Pin on Hole 4. Kyung O/C Hyun demonstrated her power with the Longest Drive on Hole 13. The Audi quattro Cup Golf Tournament Series is world’s most renowned amateur golf tournament and celebrates its 27th anniversary this year. During 2017, over 800 rounds of golf will be played by more than 100,000 competitors in more than 50 countries. The special series sees every winning team from the regional tournament invited to the national final with the chance to qualify for the World Final. The format of the Audi quattro Cup tournament involves both players in a team teeing off on every hole, then choosing the best tee shot and playing alternate shots from there until the ball is holed, with the Stableford format used to score each team. The team that scores the most points wins the tournament.